What does it feel like to be graduating? A soon-to-be graduate can often be on a emotional roller-coaster ride. On one day she might be excited to finally be done. On another, she might be stressed because there is uncertainty surrounding her future plans. The next, she might be depressed because she feels sure that stepping through the doorway of graduation is only the beginning; the beginning of the trek through life’s mundane messiness. A half-empty bag of Old Town Hazelnut coffee. Stacks of half-used post-it notes. Piles upon piles of discarded notes. Cheat sheets from ENGL 229A – the course that pushed her in the direction of English Language. The years, 5 to be precise, of her undergraduate life are coming to a close. Questions and uncertainty lie ahead of this soon-to-be graduate’s life. She is excited, anxious, and scared. Excited that she will be receiving a concrete piece of evidence of the accomplishment she spent half a decade on. Anxious to find out the next direction her life will take. Scared that her purpose in life will not be found. Yet, she wills to keep choosing to put one foot in front of the other. Loving where each step, forward or backward, will take her. Enjoying what’s left of her undergraduate experience and looking forward to what the uncertainty will bring. Here’s to the last 12 days of school! It really annoys me when buses have jerky stops. Now, why don’t I say, I really love it when buses have smooth stops? By making the first statement, I am implying the second. However, the first comment that would come out of my mouth with regards to the topic would probably be the former. Often we don’t realise how comfortable and smooth our bus journey is unless we are confronted with a really bumpy and uncomfortable one. In light of an unpleasant journey, we make sense of the massive skills a bus driver must have to not make awfully uncomfortable stops. Likewise, we don’t seem to appreciate the goodness that we have in life unless we encounter bumps along the way. Perhaps, another human flaw; the consistent folly of falling into apathetic living till something or someone brings to your life unpleasant bumps and abrupt stops. 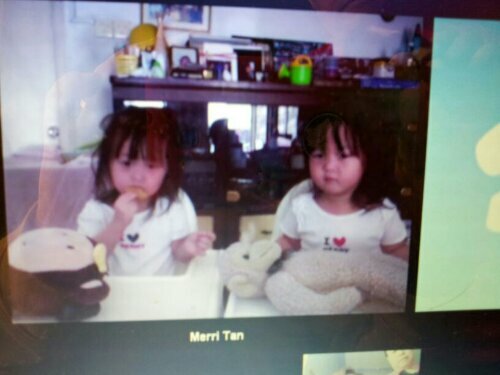 Skyping with babies/toddlers is not a simple task. After all a “simple conversation” requires that you first hold their attention. 2. Break out in song. Create a song according to a tune they are familiar with, like twinkle twinkle little star; just change up the words and sing it like u mean it. I don’t know why, but this again evoked tears.. Draw animals and say “what is this”? And then proceed to make the noises of that animal together in unison. Woof woof woof. Due to the audience participation elicited, this seemed to meet with a more favourable response. Disappear from the screen till they ask where you are, and come back on screen with a hood on your face or a really cool smile. Or crazy eyes. Or just the eye. This really made em laugh. This met with relatively little success. Although sometimes they would start crying… Success? My favourite part of this is seeing them make the same faces. I probably end up being more entertained than them and often break out it crazy laughter.. Which either gets them to join me in crazy laughter or once again makes them cry. That’s the end of the list for now. Maybe I’ll have a part two when I figure out how to get stop making them cry. But on a more serious note, let me know if you have any suggestions on how make my Skype with my awesomely cute baby sisters creative, fun, and interactive! It’s great to have everything that needs to be done in a nice, long, concrete, easy-to-follow list. Wait, what? Easy-to-follow? Easy-to-follow??!! A long checklist, believe it or not can make you a lot less productive… Let’s say, for example, that I’m working on item A on my checklist, I take my time and all is going fine. I look at my watch and hurry to finish item A so I can start on item B. As I glance to my checklist to see what to start on, I am confronted by my very, very long list… Instead of feeling motivated, I feel overwhelmed. In fact, whilst working on item B, I’m thinking and worrying about item c – v. At the end of the day, less than half of my items have been done. Of those that have been completed, besides the first, I probably would have done less than satisfactorily. The conclusion? I actually ended up doing less than I could have done because of that same checklist that was supposed to save my life. Before I come off as a silly person who doesn’t like checklists, I actually love them – checklists are almost a part of me. 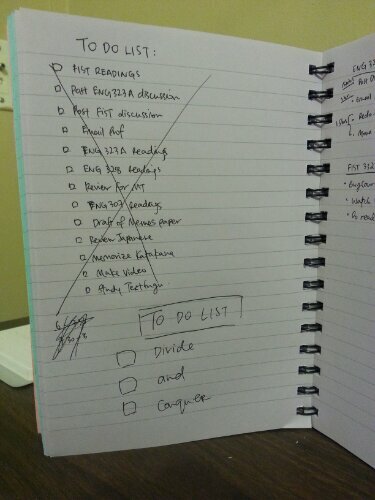 My favourite part is checking that checklist with checks – yes, I did just go crazy with my alliterations. I’m not saying to abandon checklists, rather I’m saying to stay away from allotting too much expectations on yourself in one hour. Divide and Conquer. Be realistic. Aim to complete, realistically, 2-3 things on your list. Trust me, I can totally understand that it’ll be hard to choose just 2 or 3 things on your list to focus on. But hey, the wise prioritise. With less on your checklist, you’ll be compelled to give your best to each task. Which do you prefer: 6 completely but shabbily done tasks or 2 completely tasks that you’re proud of and satisfied with? Yes, I know that time doesn’t seem like it’s on your side, and don’t believe the Nike lies – sometimes ‘just do(ing) it’ is not enough. We have to choose our fights. Come to terms with the fact that we’re only human, we have 24hrs in a day (12-19 hrs dependent on how long lazy you are) just like everyone else, and we have just as much to do as everyone else. Okay, I’ll stop there. And let’s just say that I’m going to try my best to practice what I preach! Yes, I just wrote a post on something that I’ve not actually implemented in my life, yet. So reliable is this post eh? Of course, I cleverly left this piece of information till the very. Last. Line.